Station Square Clarendon in 2 sentences: The Residences at Station Square is a luxurious mixed-use development in the middle of Clarendon that provides a variety of floor plans. Outfitted with modern decor and upscale finishes, Station Square offers high quality living in one of the most desirable neighborhoods in the area. The Residences at Station Square, also known as Station Square, is the quintessential mixed use development in the center of Clarendon. Known for its convenience, great management, and upscale residences, Station Square provides its residences with a great lifestyle in an even better location. Station Square was built in 2006 and is made up of 309 residences throughout its three buildings. The community is located at 1201 North Garfield Street, 1205 North Garfield Street, and 1220 North Fillmore Street. Like the surrounding buildings, Station Square is a high rise and features ground floor retail in one of the three buildings at 1220 N Fillmore St. Floor plans at Station Square Clarendon vary from one bedrooms up to two bedroom and den layouts. Units on the first four floors will have a quasi-loft layout with higher ceilings and exposed fixtures. Compared to units on higher floors that are a little more traditional. 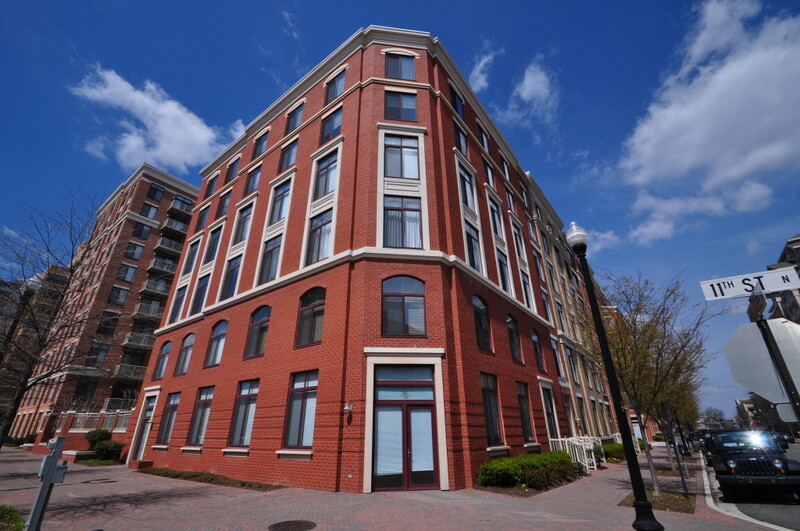 Its nuances like loft units and street-level retail that separate Station Square from other Clarendon condos like Clarendon 1021, The Hartford, The Phoenix, and Clarendon 3131. The best amenity at Station Square is certainly the location, but within the community, there is on-site management, a private courtyard, an outdoor pool, as well as a huge community room with a billiard table, kitchen, and lounge. Though there is no private fitness center in the community, there is literally a gym in the building. Gold’s Gym Clarendon is located at 1220 N Fillmore St and residents get to enjoy a discounted rate that they can add into their condo fees. Speaking of condo fees, Station Square Clarendon features an incredulously low fee. Usually with an outdoor pool and on-site management, condo fees can creep up to deal-breaking territory for potential buyers. But with ground floor retail and no gym to help offset this fee, low condo fees add to the increasing list of what makes Station Square special. The sheer size of Station Square can seem intimidating as one of the larger communities along the Orange Line, but each individual building feels like its own exclusive community. In sports, there is a saying that “You can’t teach speed”. And in real estate, I will coin a new term: “You can’t teach location”. Luxury, amenities, lifestyle, and location will move Station Square to the top of your list.